Citröen, the French car manufacturer, worked with the Russian engineer Adolphe Kegresse after the war, conceiving several half-tracked vehicles with outstanding mobility and speed for the time. The Kegresse suspension, featuring a unique solution of fully rubberized metal tracks, was also thought to be an ideal solution for the cavalry, since law forbade this corps from using tanks since 1922. 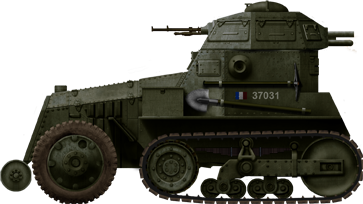 The denomination itself, AMC, for “Auto Mitrailleuse de Combat” (“Combat Armored Car”) was a disguise for its purpose. 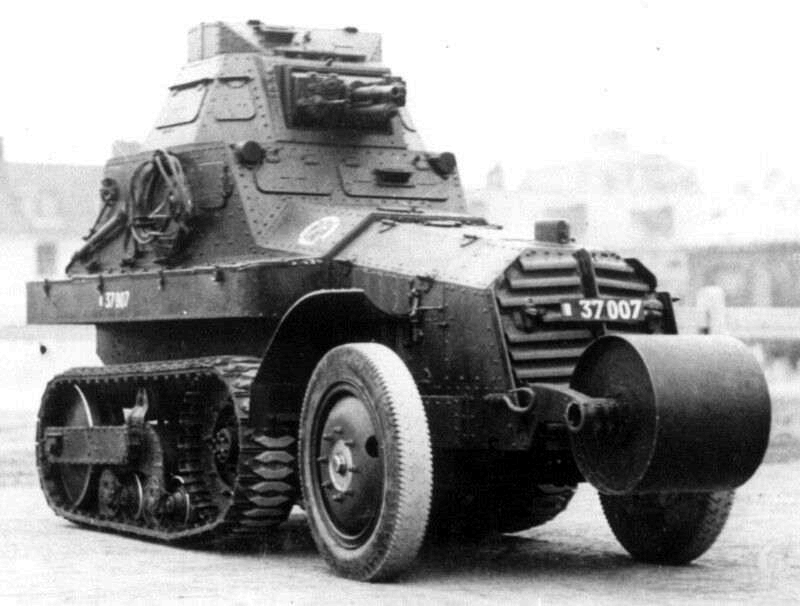 Citröen devised a military model derived from its successful 10cv P4T. This gave birth to a contract for a small series, the M23 (or “Modèle 1923”). These first 16 units were far from perfect and would ultimately be replaced by a improved model, the P16. 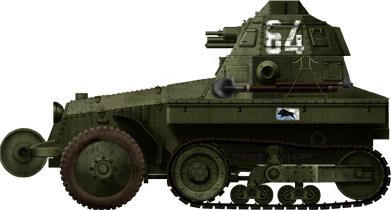 The AMC P16 (named after its first engine, the Panhard 16 CV), was designed for the cavalry corp as well. The first preseries of four were built by Citröen in 1925 as enlarged, more powerful M23s. These preseries vehicles were named Citröen M28 after completion. They also had improved Kegresse type suspension, wheels and tracks. Each comprised a front drive sprocket, two bogies (leaf sprung) each with a set of double small rubberized roadwheels, sitting on the central axle, a single return roller and a rear, large idler wheel. The chassis was entirely fitted and armored by Schneider. Armor was at most only 11.4 mm (0.45 in), only providing cover against infantry fire. The chassis received a Panhard P16 four cylinder 3178 cc air-cooled gasoline engine, developing 60 hp. Thanks to the low weight and the suspension, the speed was up to the cavalry requirements of 50 km/h (31 mph) on road and an average 20-28 km/h (12.4-17.4 mph) off-road, depending on the terrain. Consumption was 125 liters/250 km. The vehicle could cross a 40 cm (1.3 ft) obstacle and climb a 40% slope. The two drivers sat in opposite directions with redundant steering, in case the vehicle had to reverse quickly, a standard-issue feature for the twenties. The commander stood in the relatively small turret, fitted with a low-velocity 37 mm (1.46 in) Puteaux gun at the front of the turret and a single 7.9 mm (0.31 in) Hotchkiss in the rear ballmount. But the main production was assumed by a later model, the M29. A more powerful Panhard P17 replaced the former engine, an extra return roller was added, a more sturdy fixation and a larger front unditching drum roller were fitted, providing 50 cm (1.64 ft) climbing capability. The turret was modified, shortened, squared, with all the armament now fixed at the front, comprising the same Puteaux SA16 gun coupled with a more modern, fast-firing coaxial Reibel MAC 31 7.5 mm (0.295 in) machine gun. The gun was supplied with 60 HE and 40 AP shells, and the machine gun with 300 rounds, comprising AP bullets, capable of piercing 12 mm (0.47 in) armor plates. The hull was fitted with two new storage boxes, also serving as mud-guards for the rear tracks. 96 in all were delivered between 1930 and 1931. They were all put in service with the cavalry and served until 1940. 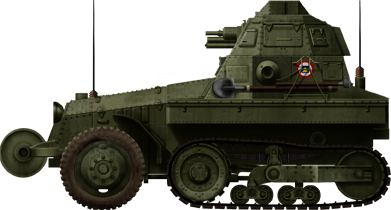 In 1932, all AMC P16s were placed in eight autonomous “Escadrons d’Automitrailleuses de Combat”, allocated to four cavalry divisions as reconnaissance units. They were then transferred to the 1ere Division Légère Mécanique (1st DLM) attached to the 1st Armored Division. 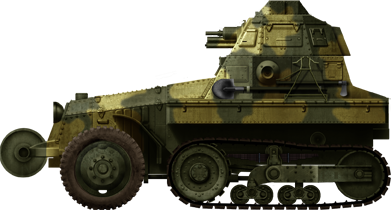 By 1937, they were replaced by SOMUA S35s and 14 were transferred to the 2e Régiment de Chasseurs d’Afrique, a colonial unit based in Tunisia, the others being spread among infantry divisions, both for support and reconnaissance, in 16-strong GRDIs (three platoons and a reserve). It is estimated that around 54 were available at the time of the battle of France in May-June 1940. Many were worn out, placed in reserve or used for training. These existing units fought well, although many were abandoned after engine breakdowns due to overstress. None were captured and none has survived to this day. Citröen Kegresse P16 modele 28, shortly after delivery in 1929. Most had the peacetime uniform factory olive green livery. Schneider Kegresse P16 m29, 18th Dragoons, 1st DLM, France, 1936. Schneider Kegresse P16 m29 radio command version, 3rd GRDI, France, 1939. Schneider Kegresse P16 modele 29 of the 1st GRDI, Northern France, May 1940.